• Architect of Record China Huaxi Engineering Design & Construction Ltd. Located in the heartland city of Guiyang, this twin-tower development seeks to enrich the city skyline with a simple modern presence that emphasizes symmetry and balance. The towers are located near the Guiyang commercial street, which is a main thoroughfare through the city, and lies south of an ecological wetland park. 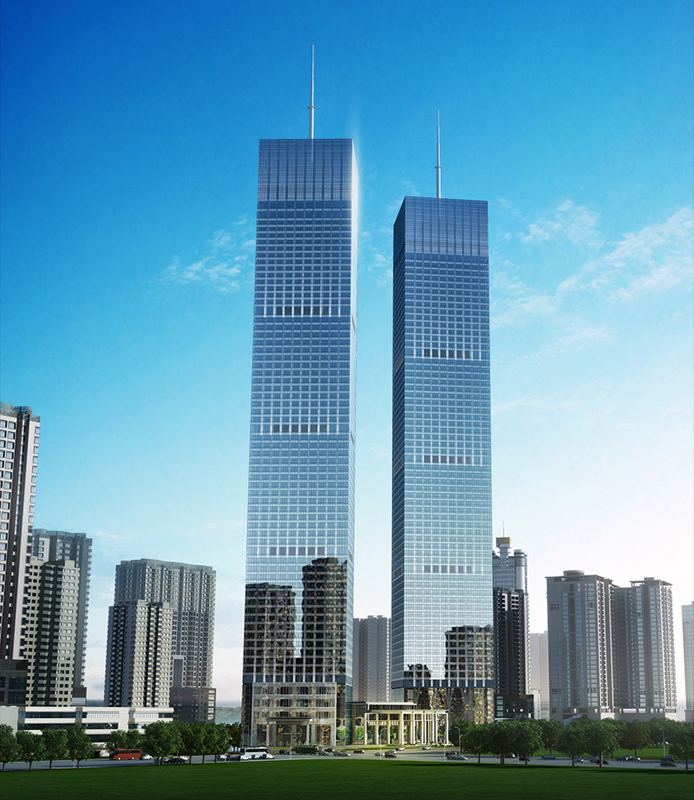 The façade of the twin towers reflects simplicity and uniformity, enriched with an assortment of explicit details. The 1.8 meter-wide glass panes cover the towers without visible spandrels, forming a streamlined appearance that unifies the complex. The two towers are offset from a large six story retail podium which then extends an additional 5 floors underground. The towers were constructed simultaneously and rose from a deep excavation of the entire site. Both towers are constructed with composite frames composed of a reinforced concrete core and exterior columns of steel fully encased in concrete. The towers are square in plan with chamfered corners and are framed with 9 structural columns on each side of the perimeter which reduces to 5 large columns at the base through the use of a load transfer of diagonal columns spanning through four floors just above the main lobbies. The perimeter structural grid remains the same for the full remaining height of the east tower, however on the west tower, this grid reduces to 7 columns on each side for the uppermost floors where a hotel is located above office space. 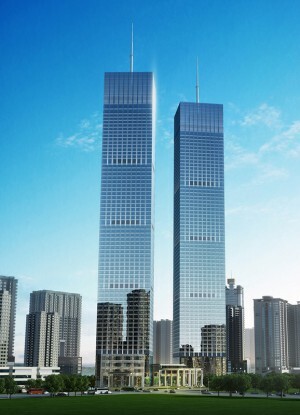 When the towers were completed, they became Guiyang’s first supertall buildings as well as the centerpiece of an emerging cluster of new tall buildings on the western side of the city.